Aim of this paper is to present a methodology useful to optimize the geometry of the blades of a small-size wind turbine which are obtained from a circular pipe: an optimal chord distribution and airfoil sweep can be obtained with a proper cutting path. A strong reduction in manufacturing costs and time can be achieved for blades which are a critical element in wind turbine systems, especially in case of renewable plants in developing countries. 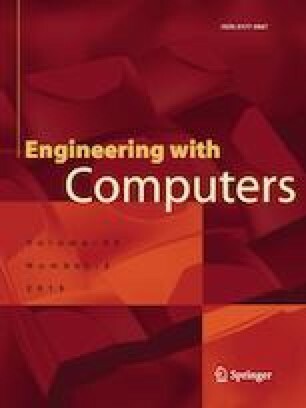 An algorithm has been developed to obtain the shape of the blades and wind turbine performances are computed by the Blade-Element Method, due to its low computational simplicity; the XFoil tool has been used to compute the aerodynamic of the blades. Heuristic algorithms have been applied to obtain a feasible design solution assuring the best efficiency of the wind turbine. Also structural considerations are kept into account to provide a feasible configuration able to withstand the forces acting on the rotating blades. Results obtained suggest that an optimal design of such a kind of blades can be obtained thanks to this methodology. The mathematical framework developed for the optimization is efficient and the heuristics algorithms allow the convergence to feasible configurations. The computing time is compatible with a practical application of the method also in industries. As already introduced in the Sect. 3 of the paper, the basic methodology to optimize wind turbine blades comes from the integration of Momentum Theory and Blade-Element Model. The Momentum Theory finds the axial force and torque of a wind turbine evaluating the behaviour of the air stream through the area swept by the wind turbine blades.